Whether you need to keep track of the available ports or IP addresses in a LAN network or you want to monitor and determine the devices that are connected, network IP scanning can come in handy. Dipiscan is a networking tool. This is a lightweight software that will help you discover the full range of LAN IP addresses to detect all devices or computers connected to the network. You will be able to determine the status of computers by scanning a range of IP addresses or by entering the exact address. In addition, you can learn more about FQDN, NetBIOS name, domain user, MAC address, network adapter, server, operating system and much more. Whether you need to keep track of the available ports or IP addresses in a LAN network or you want to monitor and determine the devices that are connected, network IP scanning can come in handy. 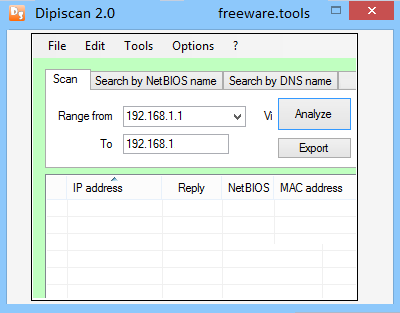 Dipiscan is a lightweight piece of software designed to help you discover the complete range of LAN IP addresses and detect the devices or computers connected to the network. Since the program is portable, it does not require installation, but rather you can decompress the archive in any desired location on your local drives. You will be happy to learn that the tool does not need configuration, so you can just add the IP address, DNS or NetBIOS and establish if the computer or device is connected or not. The application comes with a minimalistic, yet appealing and clean interface that is unlikely to give you troubles, regardless of your experience with similar utilities. Therefore, you can either determine the status of the computers via an IP address range scan or type the exact address and manage the PC as required. The highlight of the app stems from the fact that the tool does not rely on DOS commands, an option that is known to cause various issues on various computers. On the other hand, you should bear in mind that the tool allows you to automate the scan analysis by accessing it command line mode. It is worth mentioning that the application allows you to follow IP addresses that are problematic and even manage them remotely if the situation requires it. In addition, you can learn more about the FQDN, NetBIOS name, domain, user, MAC address, network adapter, server, OS, description, shares, reply as well as the commentary previously made. All things considered, Dipiscan is a quick and straightforward tool designed to help network administrators discover the active and inactive devices in the LAN so that you can manage them accordingly.